Without realizing it you may well have seen photos of the rainbow mountains in Peru before. They are, arguably the most photogenic and picturesque mountain range in the world and feature frequently on traveller's bucket lists. 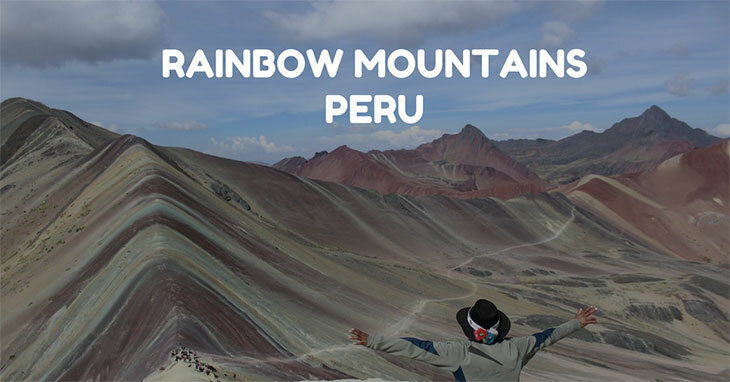 Read on to find out why the rainbow mountains, Peru need to be high on your must visit South America natural wonders list too. What are the rainbow mountains, Peru, really called? Are the Rainbow Mountains really a rainbow? How Do I Get to Rainbow Mountains, Peru? Do I Need to Be Fit to Climb the Rainbow Mountains? What Do I Need to Take With Me to The Rainbow Mountains? When Is the Best Time To Visit the Rainbow Mountains? Can I Visit the Rainbow Mountains in One Day? What to Expect From the Rainbow Mountains? Obviously, rainbow mountains are just an informal name for these colorful peaks in Peru. The rainbow mountains real, geographical name are the Ausangate mountains which make up a part of the giant mountain range, the Andes. Although the Ausangate mountains do not feature all the colors of the rainbow they are the most brightly colored, and varying in color, mountains in the world. So you can allow a little poetic license here. They feature shades of red, yellow and green. In certain lights, the Ausangate mountains appear deep purple colors and even blue in places. Rest assured, the photos you see in travel books and on the internet are real, and not that heavily photoshopped. The best starting point for the Ausangate mountains is Cusco, the city that lies a 3-hour drive away. You can get to the Ausangate mountains by driving; hire a taxi, get a public bus or even rent a car for the day and do the drive yourself if you are a true traveler. The last village you pass is called Hancipacha, from here follow the directions of your GPS or your road map to the letter as you do not want to get lost and lose a day hiking in this spectacular landscape. The rainbow mountains are real mountains but unlike Mt Everest or Mt Kilimanjaro you need not have a professional guide or be training for months in advance. A reasonable level of fitness is required as stamina is the key. There are no real tests of physical strength rather you need the endurance in your hiking to last the day. No mountaineering skills are needed but if you have the opportunity to do a few reasonably long hikes before you reach the rainbow mountains you will thank yourself later. If you are unfit or injured or to be honest just plain lazy you can hire a horse from a local farmer for the day. Your horse will carry you up and down the mountain again and you will be joined by a guide to ensure your safety (to a degree) and that the horse goes the right way. That said, they are so familiar with the route the horse alone could be your guide. An essential item would be a sturdy and durable, not to mention super comfortable, a pair of hiking boots. However much you may like your flip-flops or loafers this is the occasion for hiking shoes. Hiking boots offer you better grip and more importantly support around your ankles. The route is not smooth so your ankles need all the support they can get, this, in turn, helps reduce the chances of getting a cramp. The best time to visit the rainbow mountains, and in fact, any outdoor activities and pursuits in the Cusco region of Peru are between March and November. So from late spring to mid-autumn. The clear blue skies that appear in June, July and August provide an awesome contrast to the rusty red hues of the mountains and make for the best photos. Not only this but the day long sunshine makes hiking nice and warm despite the altitude. If you get up before the sun rises you can complete a small hike of the rainbow mountains in one day. Even though the rainbow mountains are a three-hour drive away from the city of Cusco is it possible to have a one-day turnaround. It’s a long day but it is certainly worth getting up early and remember that you can always sleep in the car back to the city! Heading to the rainbow mountains means heading away from luxuries like western toilets and heating. You need to remember that in more rural areas the living arrangements are less developed. You can hike alone but to make the most of your time you need to hire a guide. These local guides are great fun, professional and allow you to walk at your own pace. Unless you are injured you cannot guarantee to get a horse for the hike. So the earlier you get to the base as early as possible. Be warned that there are some sections of the hike that are so steep that you have to get off the horse and walk yourself.